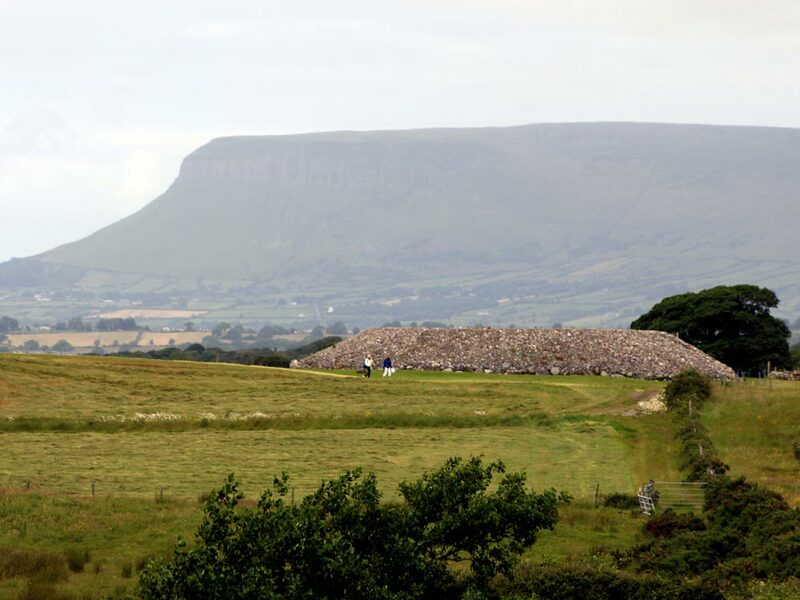 Looking west to the magical hill of Knocknarea from Circle 7, the most complete monument remaining at Carrowmore. 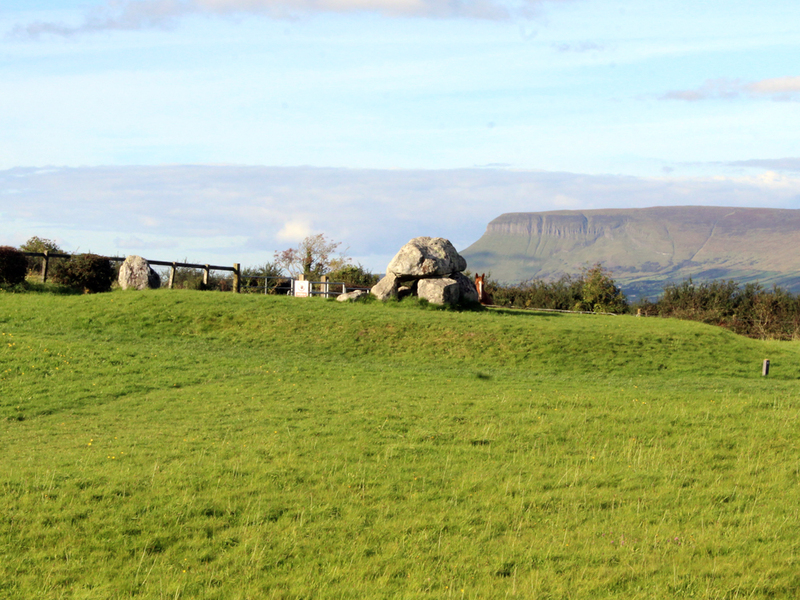 County Sligo is home to the largest and oldest collection of stone circles and dolmens known from neolithic Ireland. 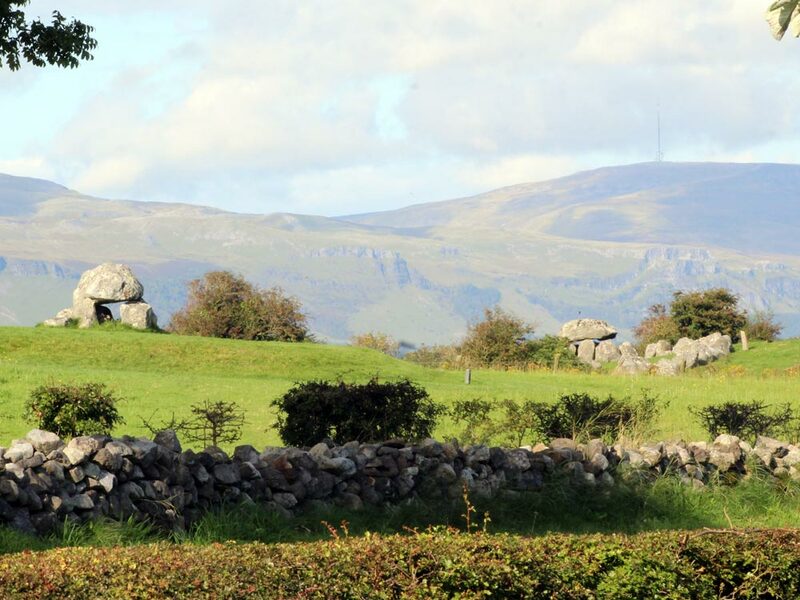 These are found at Carrowmore, a collection of burial monuments at the center of the Coolrea peninsula three kilometers west of Sligo town. 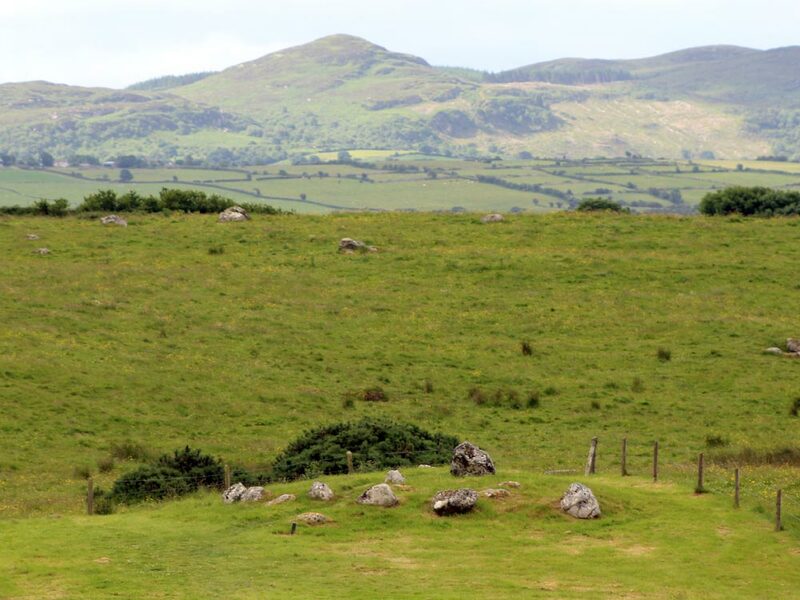 A slideshow of the monuments at Carrowmore. 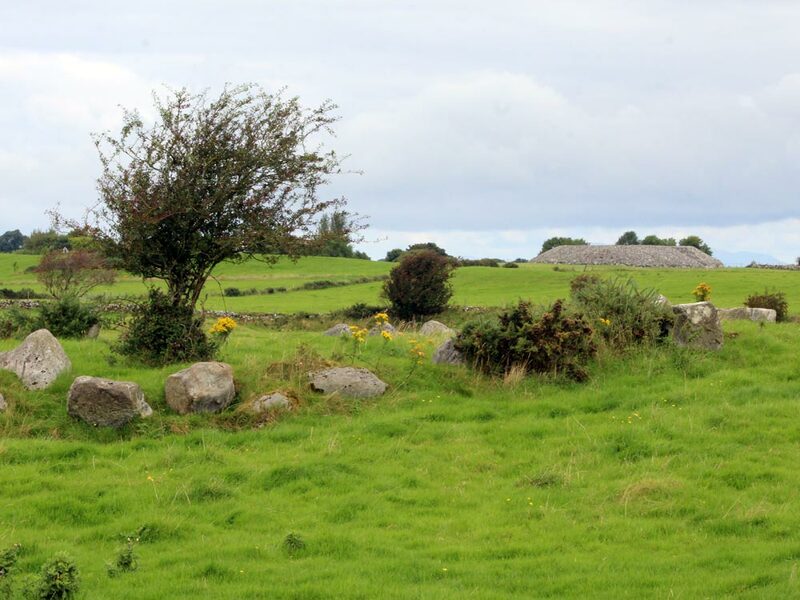 Carrowmore is located at the heart of the Cuil Irra peninsula, a spit of land bounded by water on three sides. 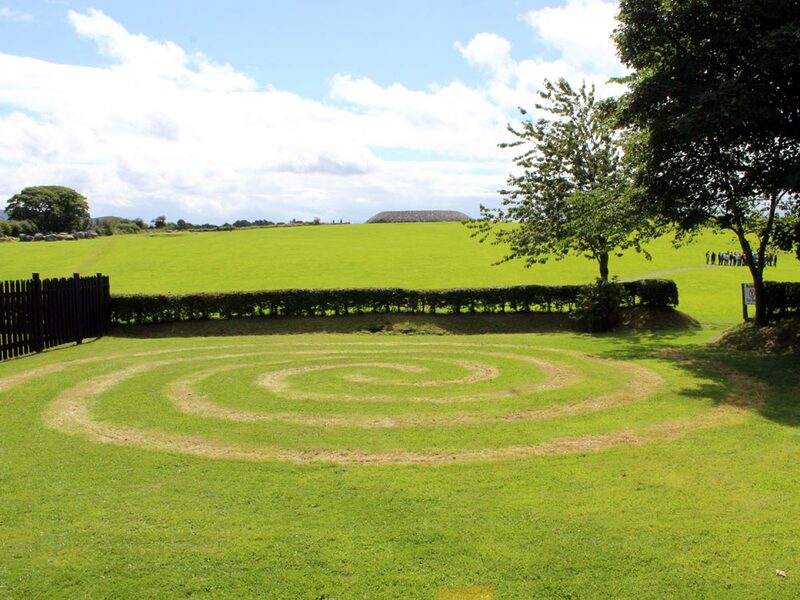 Ballisodare Bay lies to the south, the Atlantic ocean to the west and Sligo Bay to the north. 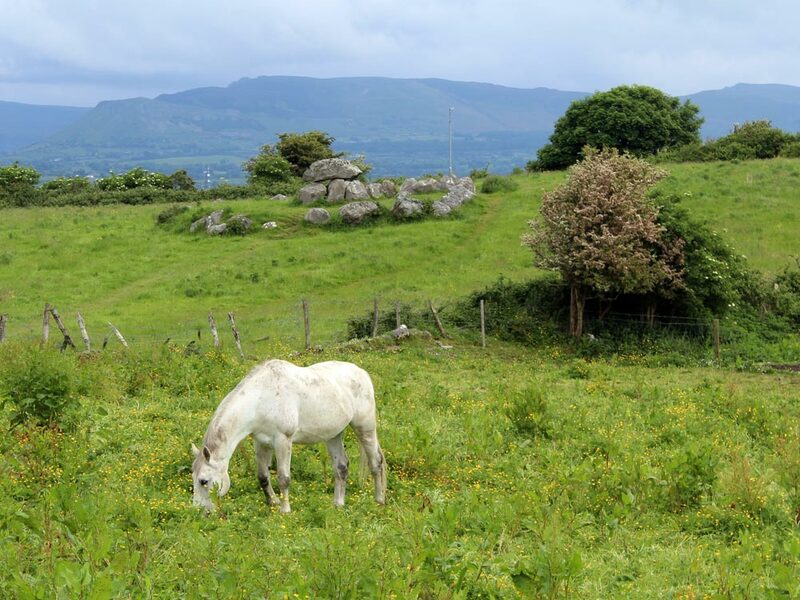 Lough Gill is to the east beyond Carns Hill, connected to the sea by the short shelly Sligo river, the Garavogue. 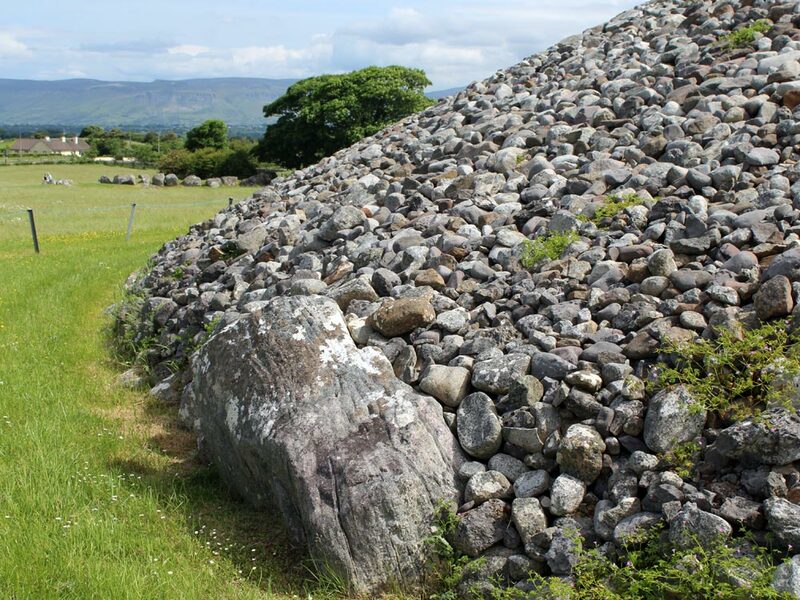 The stunning cairn topped mountain of Knocknarea is 4 km to the west of Carrowmore, while the smaller, but equally important Carns Hill is 4 km to the east. 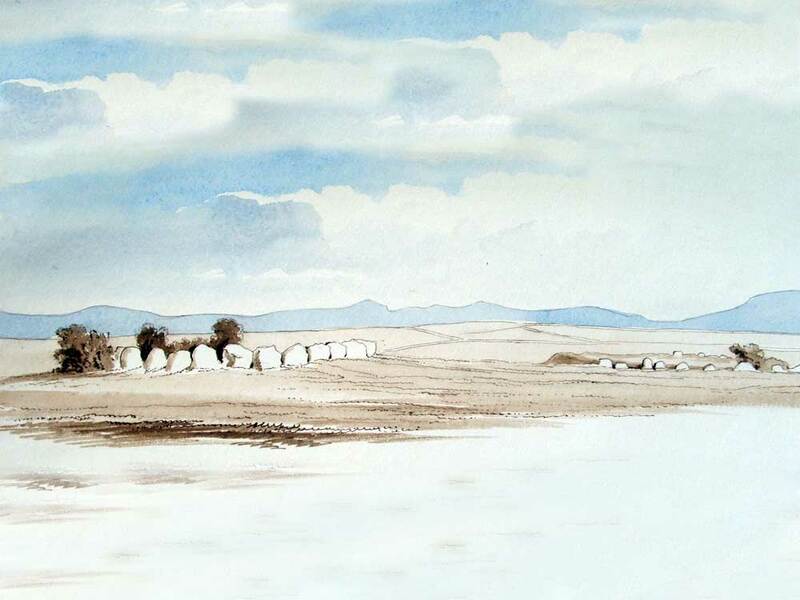 There are more neolithic buildings on the summits of the Ox Mountains to the south. 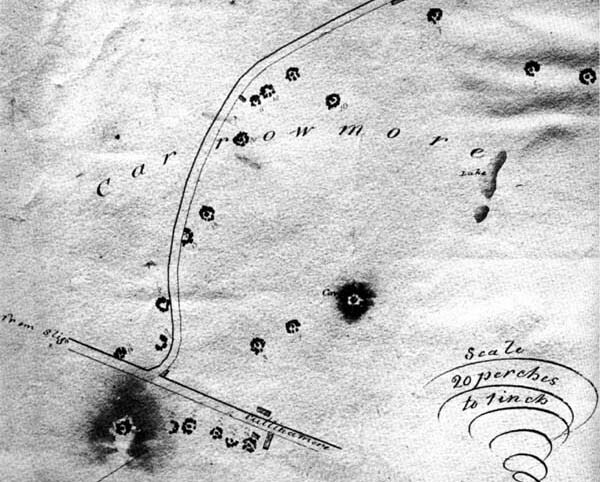 Berenger's 1779 map of Carrowmore. 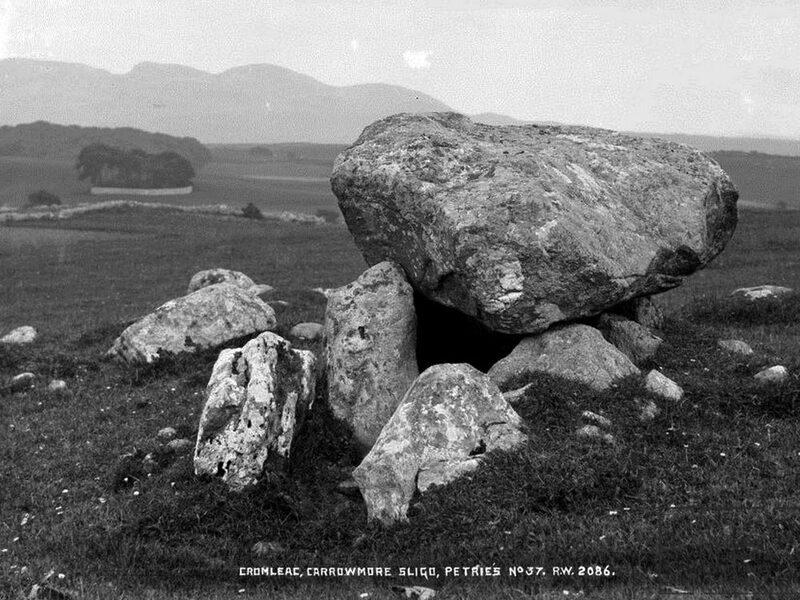 Thirty monuments remain at Carrowmore today, in varying states of preservation and completion, the most perfect being Number 7. 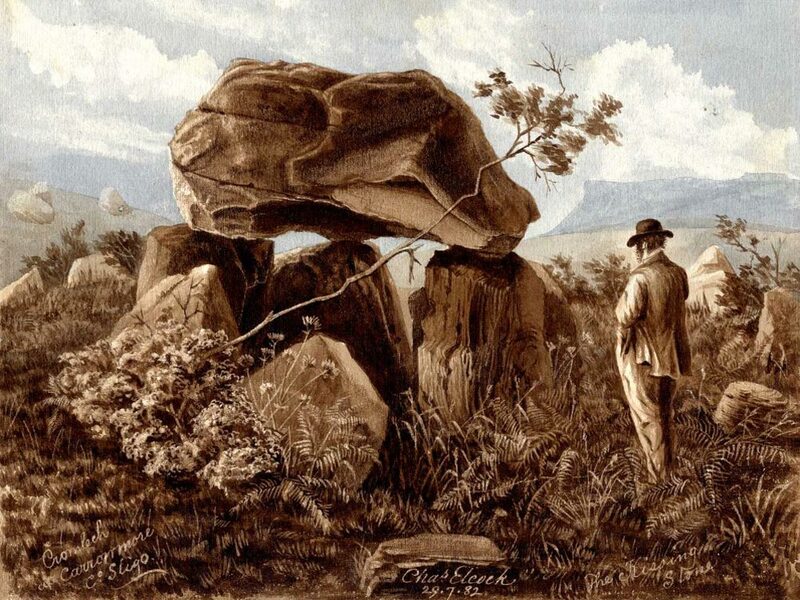 The antiquarian George Petrie noted 65 monuments during his visit for the Ordinance Survey in 1837, but today the number is thought to be considerably lower at a probable maximum of forty circles. 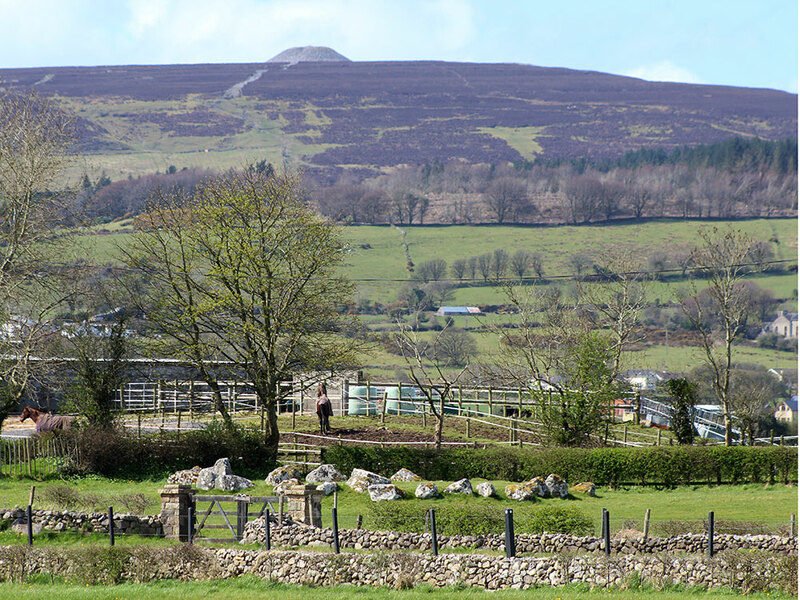 The sites were badly damaged in the early years of the nineteenth century by land clearance and gravel quarrying. 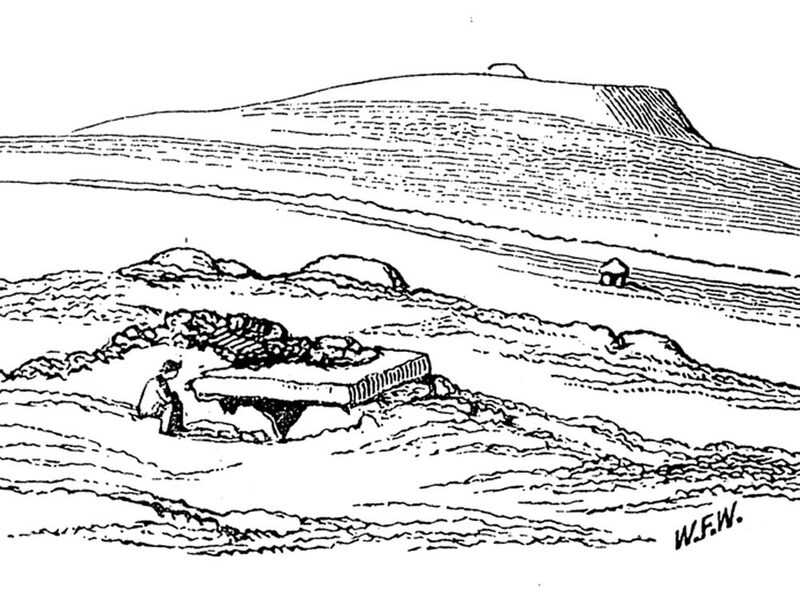 Circles 56 and 57 and a number of Carrowmore circles were illustrated by William Wakeman in 1879. 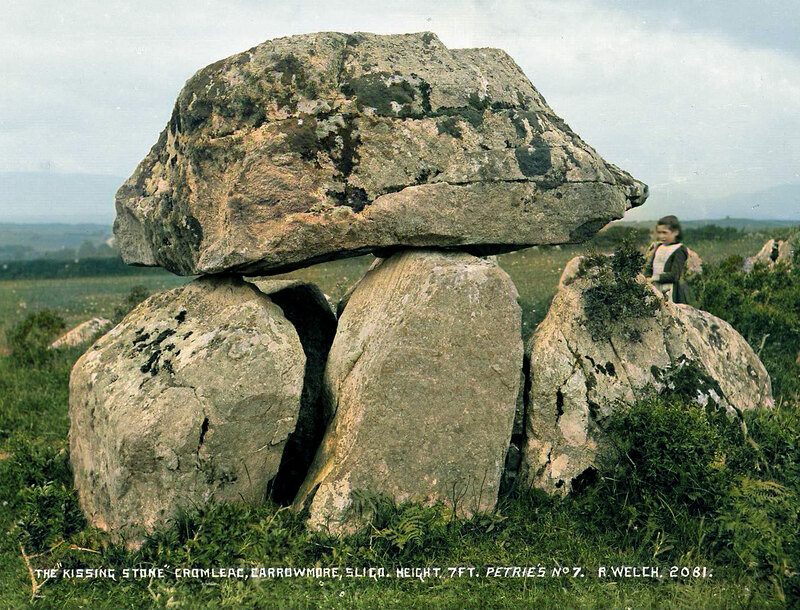 Image © Sligo County Library. 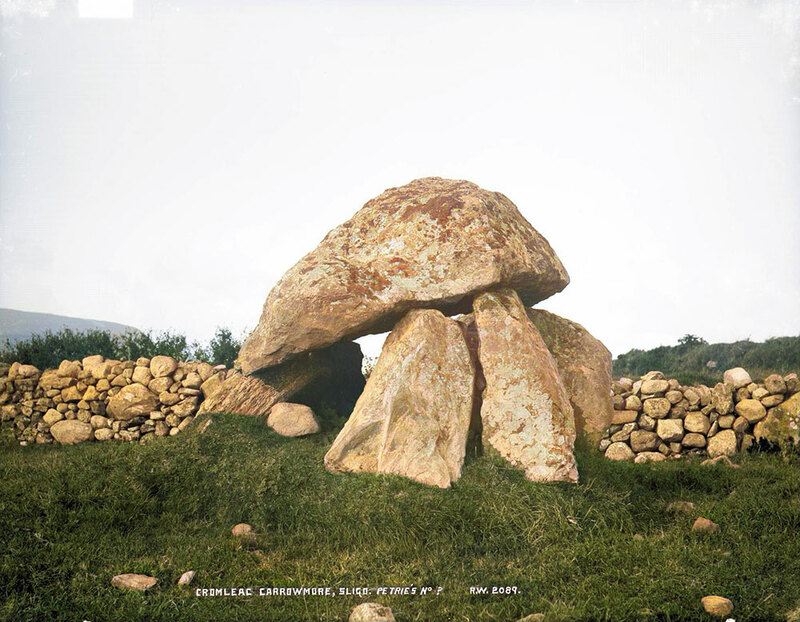 This website provides a virtual tour of the monuments at Carrowmore, with a page for each monument and its history of research. 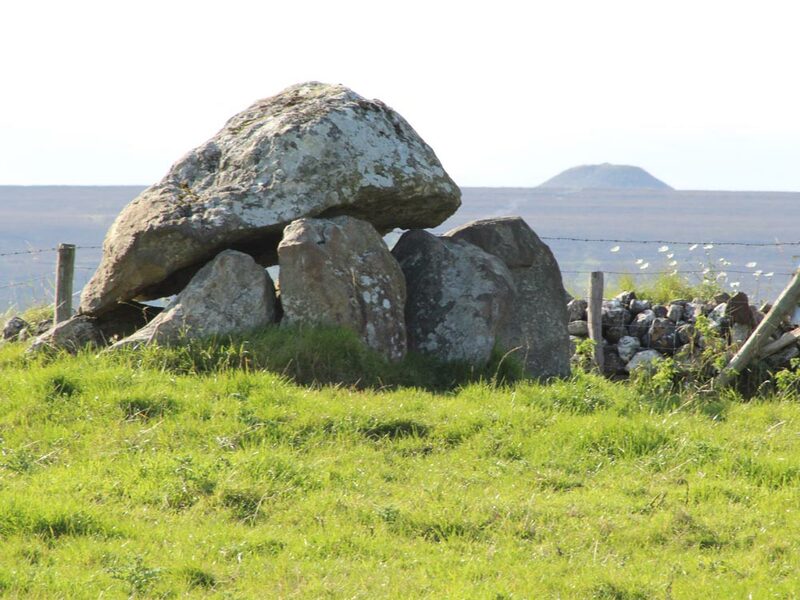 New information from DNA suggests that the monuments were built and used by people who came by sea from France around 6,000 years ago. 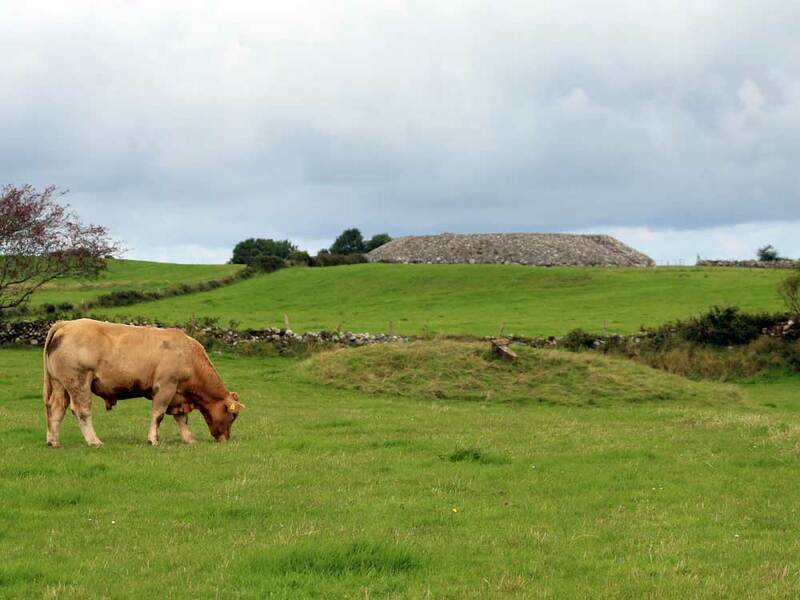 These voyagers brought the first cattle to Ireland, and existed by herding their cattle through the forested landscape. It seems that they also re-introduced the red deer to Ireland, the native species having become extinct after the ice age. Because so many of the monuments have been destroyed, the only remaining records of some circles are the comments by Petrie and Wood-Martin and the illustrations of William Wakeman. 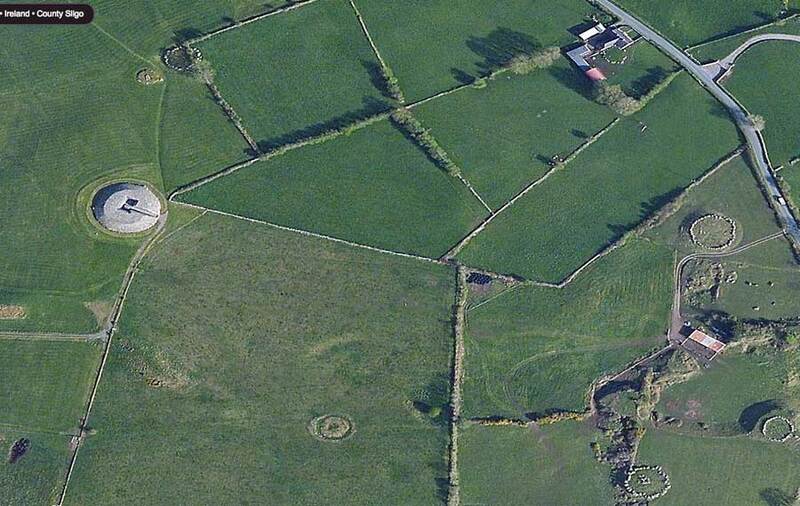 Carrowmore from above showing the restored cairn, Carrowmore 51, with, going clockwise, circles 56, 57, 17, 18 (on both sides of farmhouse, top right) the largest circle is 19, 26, with Circle 27 at the bottom right, and lastly a ring barrow. Photo © Bing Maps. 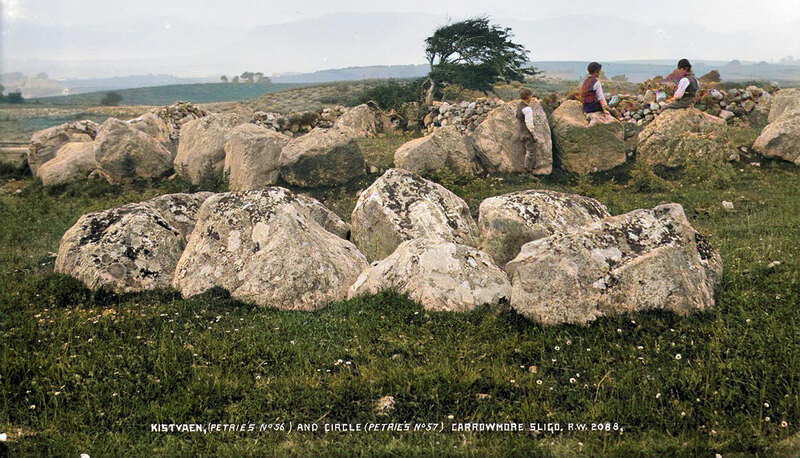 The type of monuments found at Carrowmore are boulder circles with central dolmens and sometimes rudimentary passages. 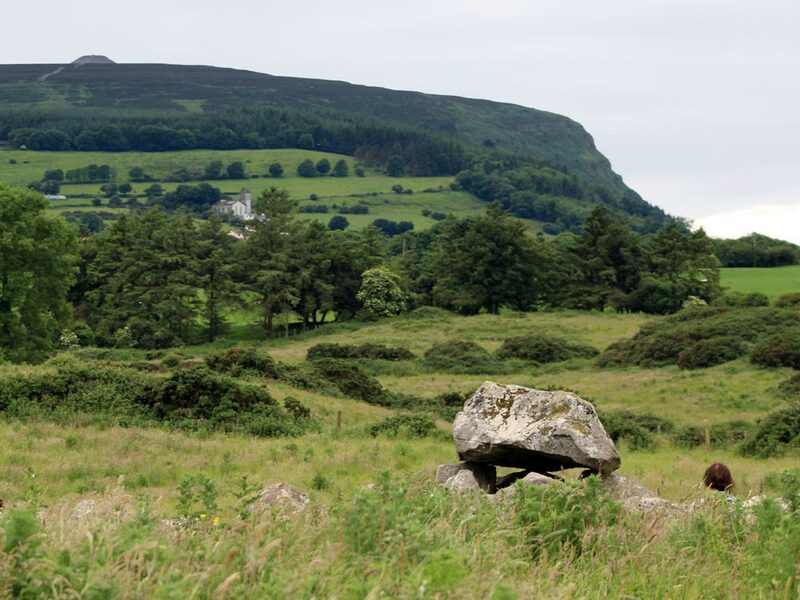 They are among the earliest megalithic of chambers built in Ireland; dates from carbon dated red deer antlers, show that the chambers were used between 5,800 and 5,000 years ago. 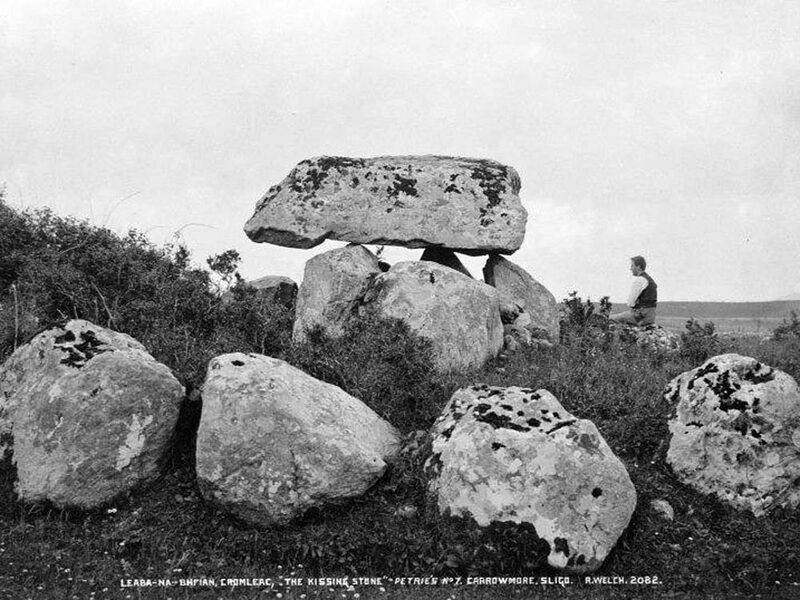 Originally each of the sites had a raised platform which was up to a meter above the surrounding ground level, sometimes with one or more inner circles of smaller stones. 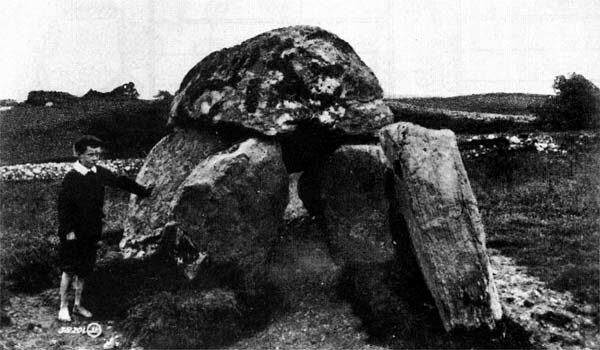 An old photo of the dolmen at Site 13, Carrowmore. 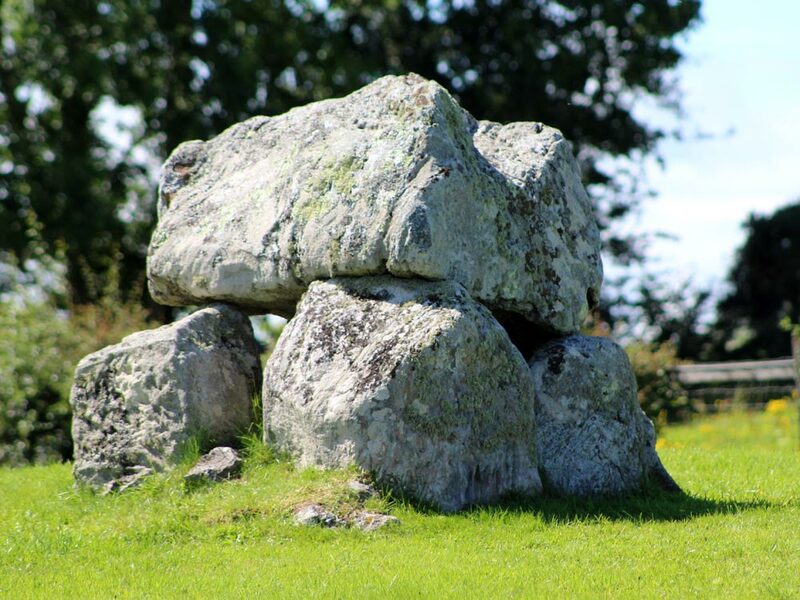 The stones used to construct the monuments are a very hard form of glacial rock called gneiss, which comes from the nearby Ox Mountains. 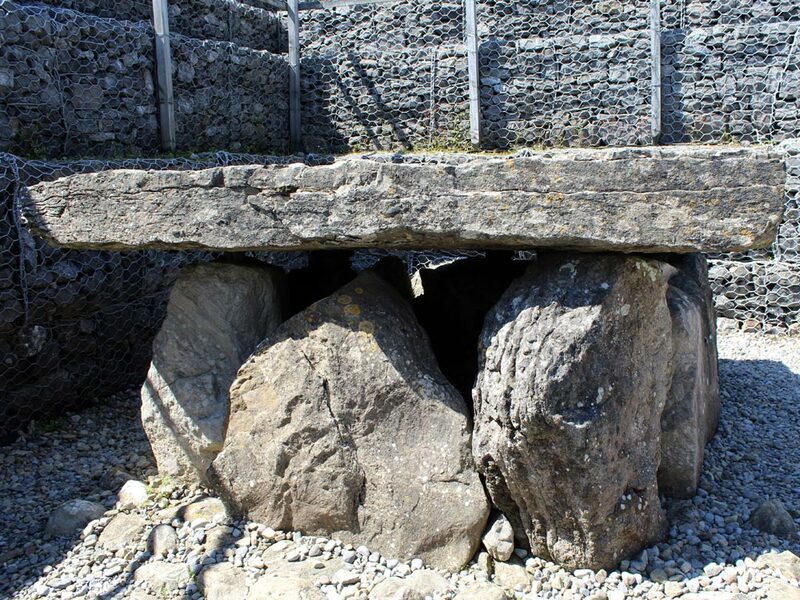 There are an average of 30 - 35 stones per circle, set side by side and placed standing upright. 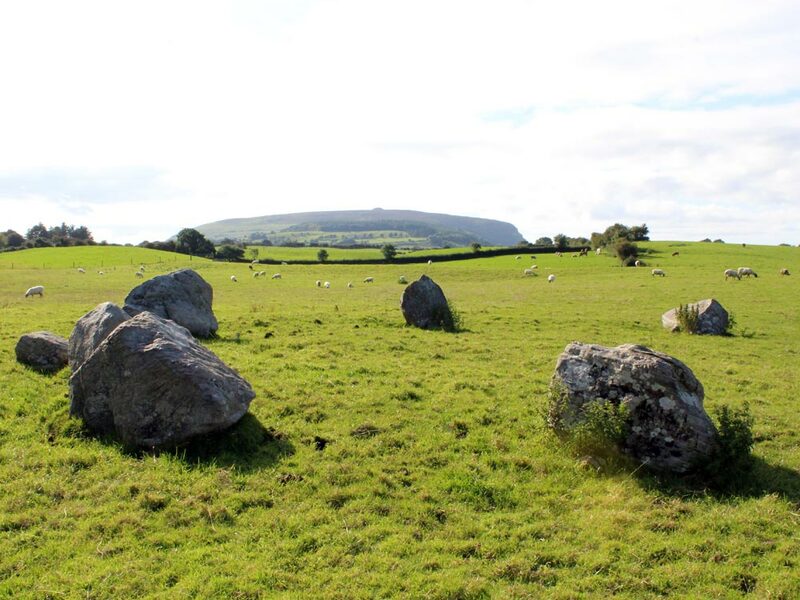 The average diameters of the Carrowmore circles are 10 - 12 meters, though a few monuments such as 19, 22, 27 and 51 are larger. 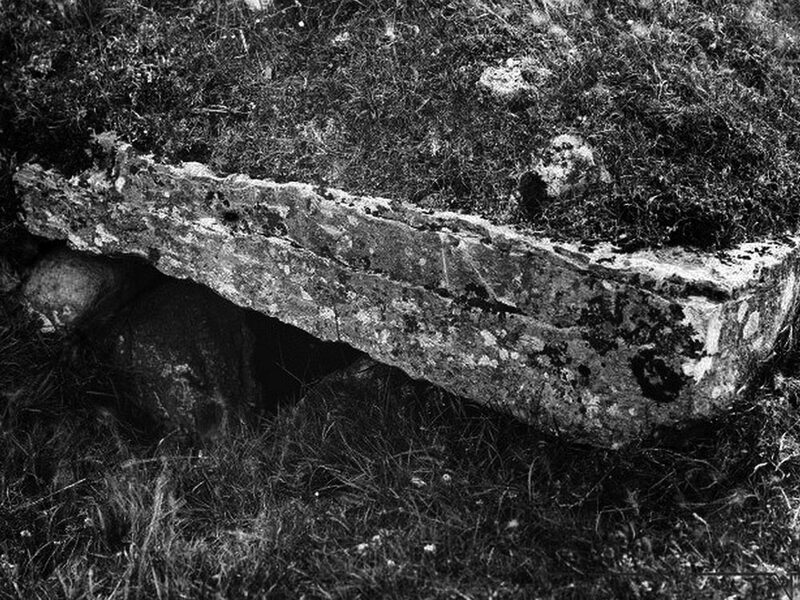 Carrowmore 7, the Kissing Stone, is the most intact example remaining today. 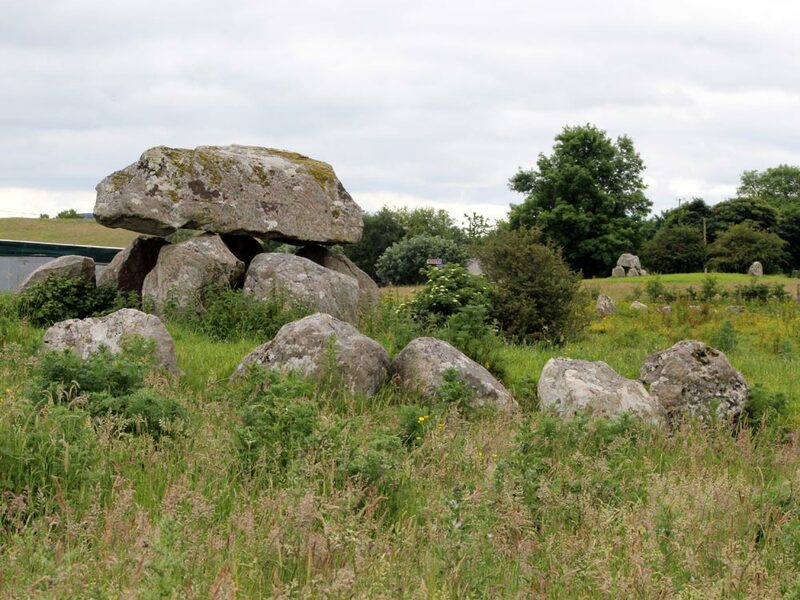 It consists of a circle of boulders about 11 meters in diameter, and has a beautifully graceful dolmen, or stone table at the centre. 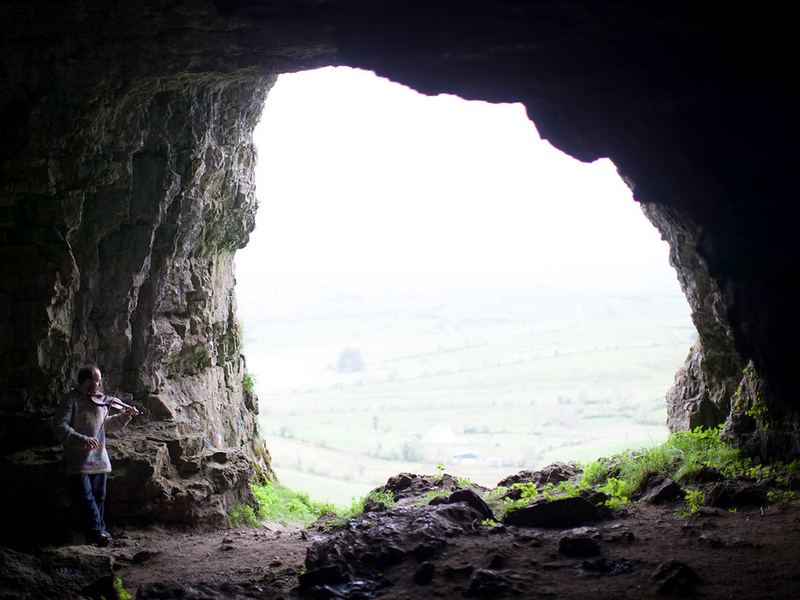 The sockets of missing stones were found during the excavations, which show that there was once a short passage leading into the chamber. 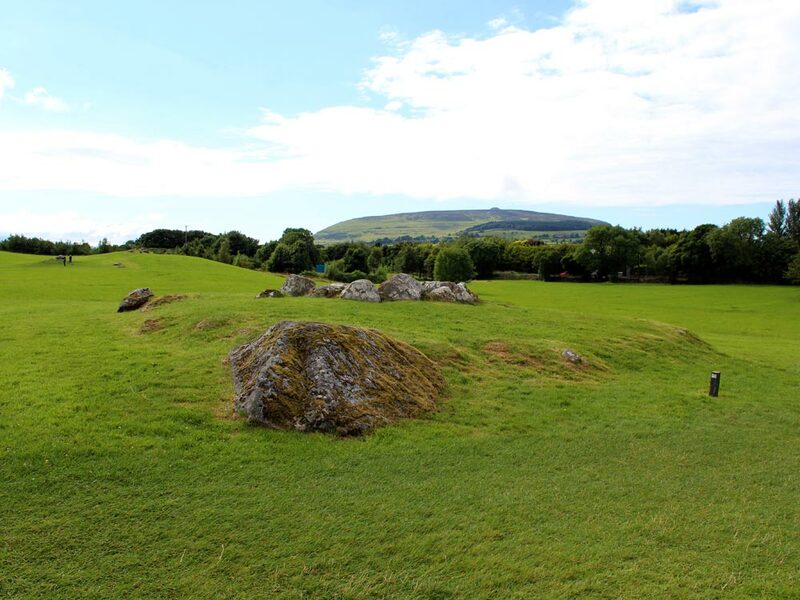 About 14 of the monuments have passages at Carrowmore. Circle 27 during excavations by the Swedish team. Photomontage © Göran Burenhult. 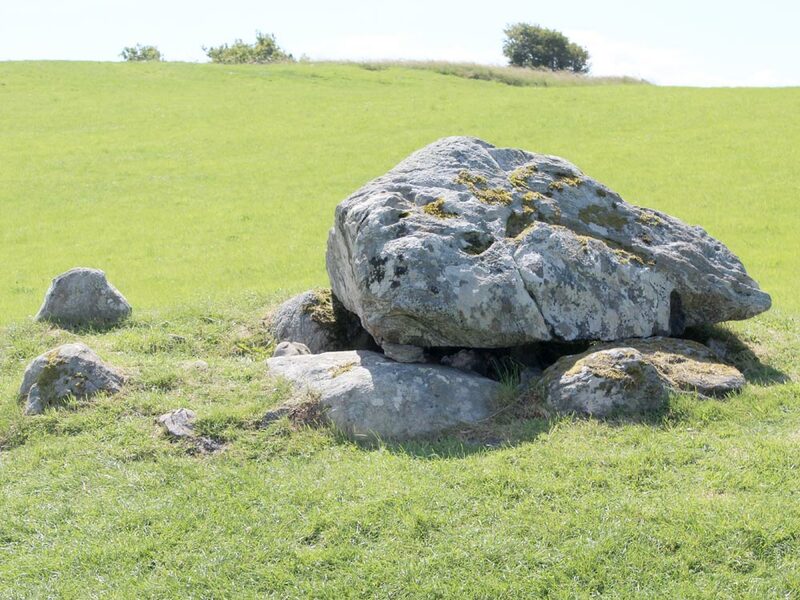 Sometimes the larger boulders were split in half, a feature that can be seen in the chamber of Site 27. The rock is rich with veins of quartz, and was carried to the site by retreating glaciers during the ice age. 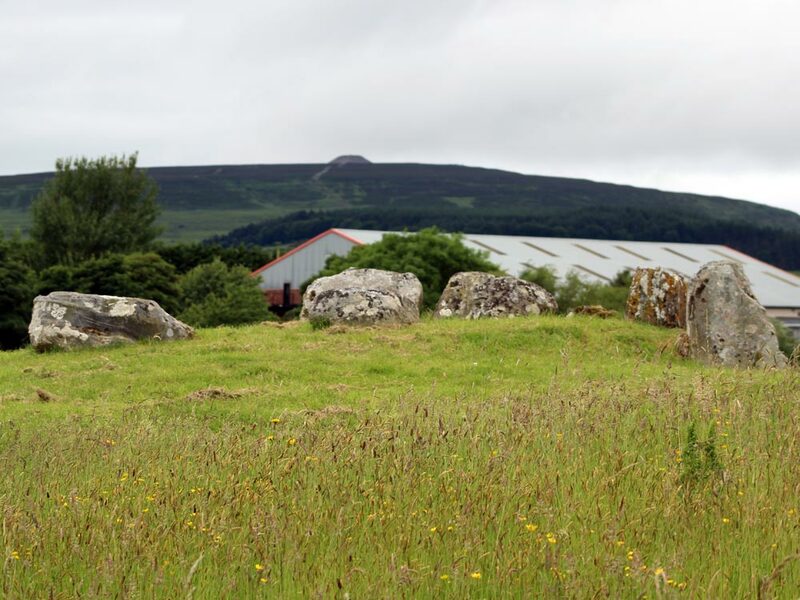 Several fields of gneiss boulders lying as they were dropped by the galciers can be seen on the south slopes of Knocknarea, which give an impression of what Carrowmore could have looked like before the circles were built. The Coolrea peninsula is limestone covered with a mantle of glacial gravel. The complex is located on a plateau at the centre of the peninsula, with the circles built around the edge. 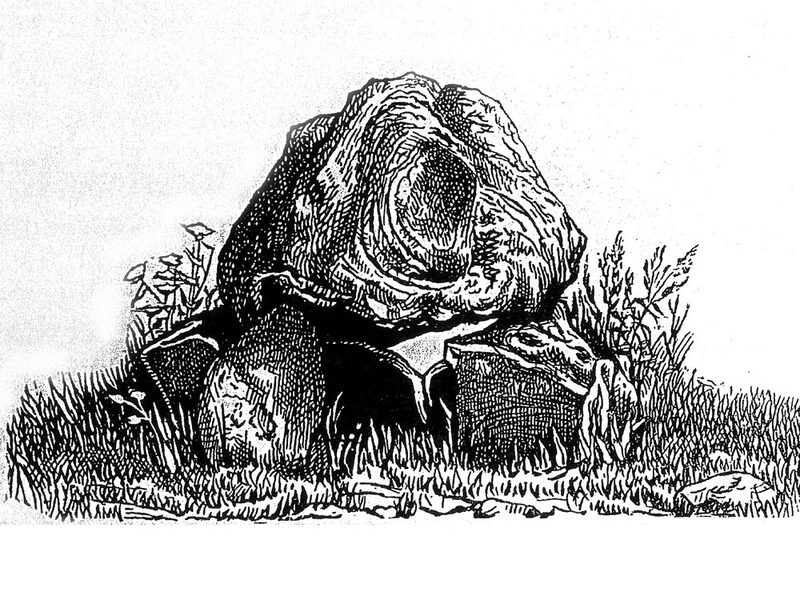 Some limestone slabs were used in the monuments, but few compared to the more plentiful gneiss boulders. 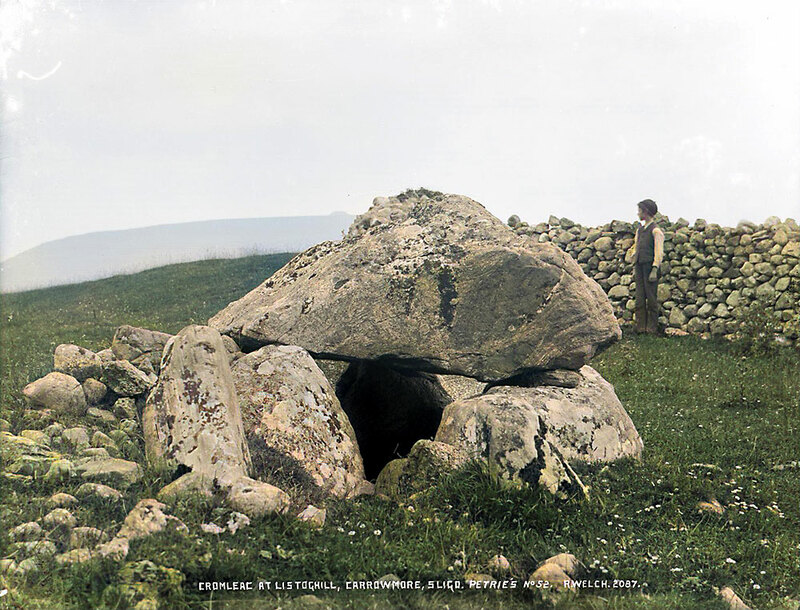 Listoghil, the central monument at Carrowmore by William Wakeman, 1880. 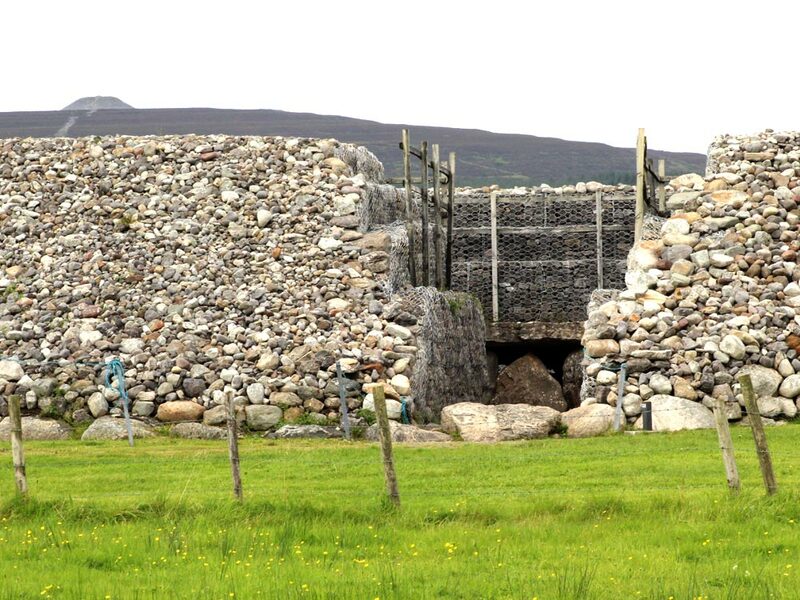 A good example is the massive capstone on the chamber at Site 51, which may have been quarried at the Glen in the south slope of Knocknarea. 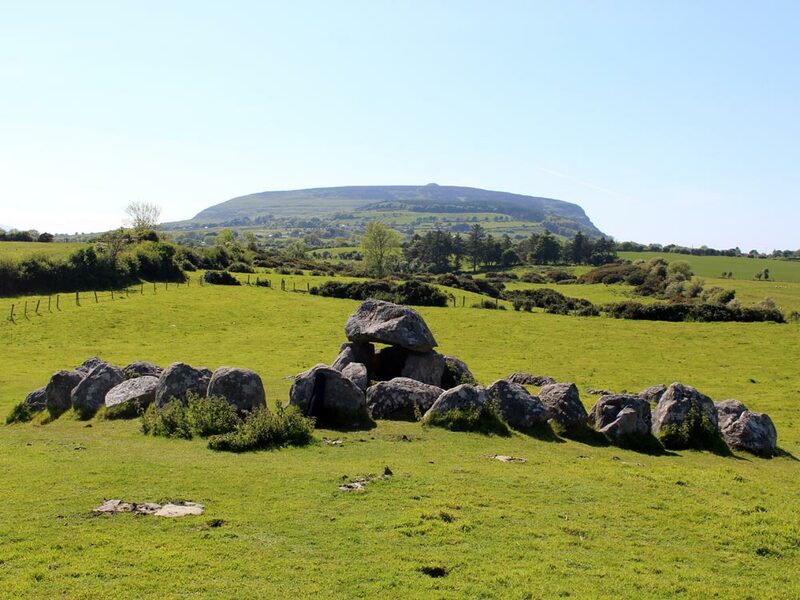 Fragments of quartz were found in some of the circles, and these would have come from the Ox Mountains to the south, specifically from the area around Croghan. One small piece of rock crystal had a hole drilled through the end and was used as a pendant or pendulum. 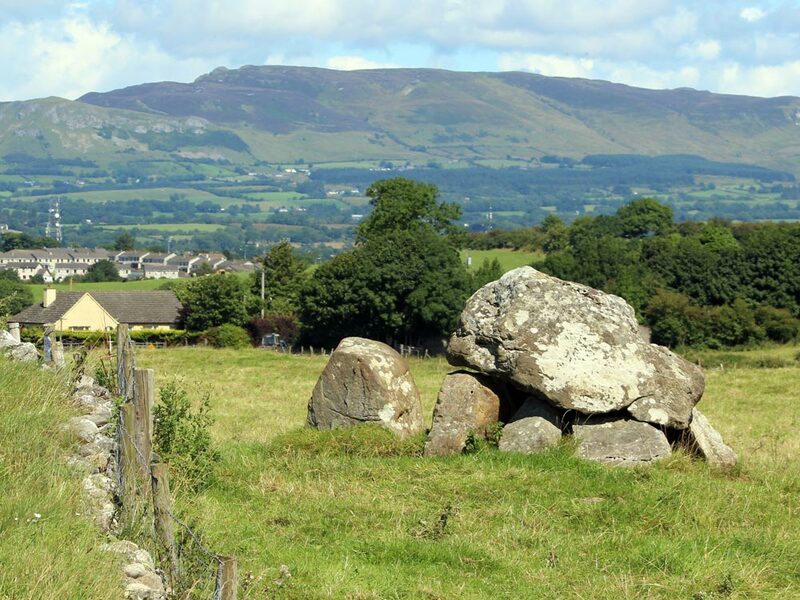 There is no evidence of stone cairns having covered the dolmens at Carrowmore; they appear to have been free-standing much as we see them today. 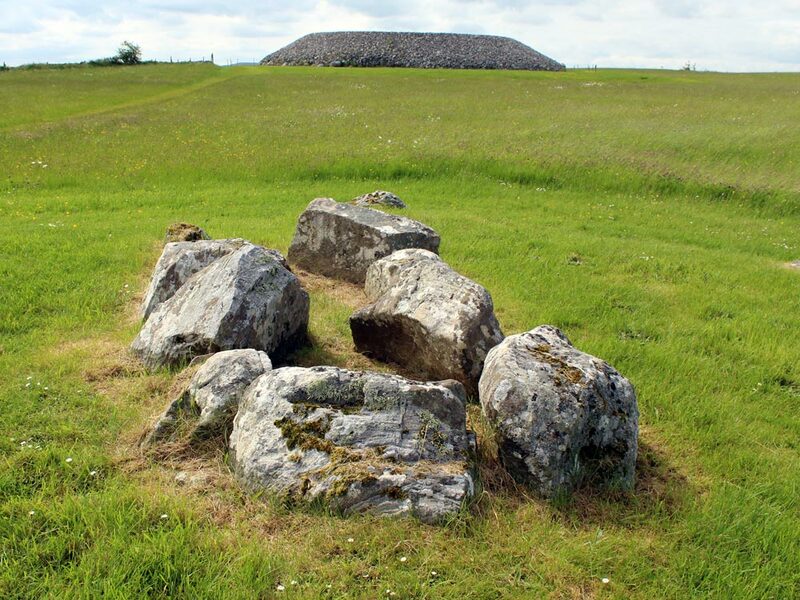 The exception is the central focal monument, Listoghil, which was buried in a great cairn of stones around 3,200 BC. 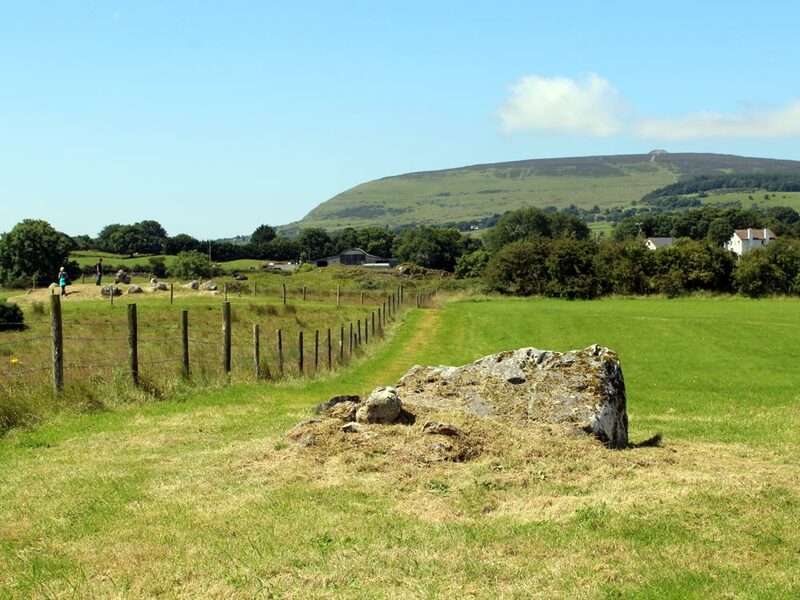 Carrowmore is managed by the Office of Public Works, and there is a small visitor centre and information display which is open from Easter to the end of October, with a cover charge. 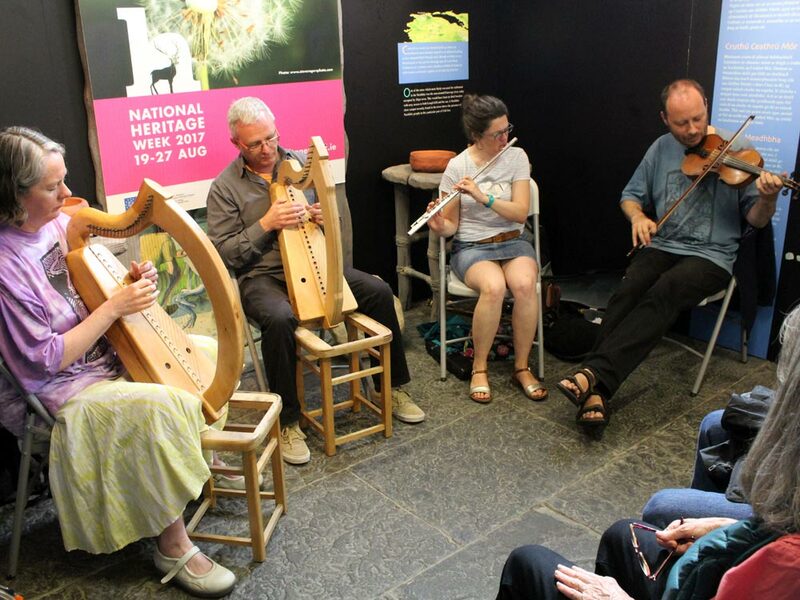 Guided tours are provided to groups - book in advance. 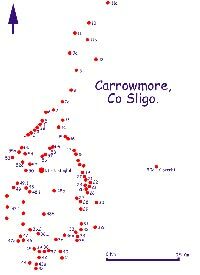 Carrowmore is well signposted from Sligo Town and is easy to find. Details of opening hours and fees for 2018 can be found here.